Some people may wonder why we specialize in mid-century building products instead of making “complete” products for people. Well, we’re firm believers in the Do-it-Yourself movement, the same movement that gained momentum during the heyday of our products, the 1950’s. 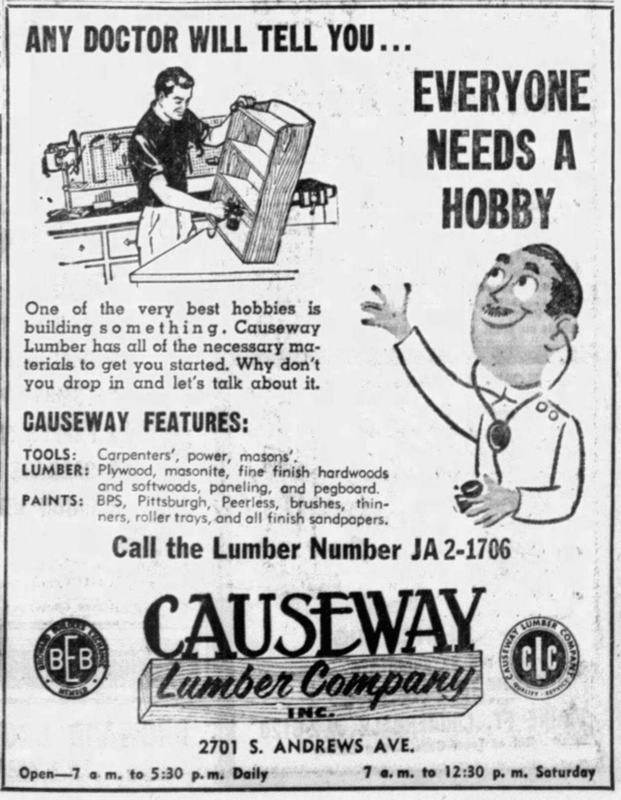 Back then the do-it-yourself hobby (which built into a bonified craze) was thought to incorporate surefire psychological therapeutic benefits, and we couldn’t agree more. We believe that there is nothing finer than building something with your own hands and putting it to use in your home. Our kits and products are meant to be simple to use and come with detailed instructions so that everyone can reap those happy DIY endorphins. But don’t take our word for it; here’s a short history of that DIY craze. First, let’s travel back to the Victorian age. The Arts and Crafts movement hails from Victorian times and women were the original DIYers around the home. Decorative products abounded made from women’s hands, but as for home repair, those tasks were mostly hired out or handled by servants. After all, civilized Victorians and true gentleman would not undertake such menial labor. Before 1870, only 10% of men worked for others instead of jobs at home such as farming. Who wanted to finish their “job” for the day and then work some more? Even so, in publications such as Popular Science (first published in 1872) and Popular Mechanics (1902), the seeds of do-it-yourself were being sewn through the publication of plans for “labor saver” contraptions that one could build to assist with the home. However, the do-it-yourself movement was still not yet fully realized. For example, in 1941, the DuPont company released a showroom brochure showing a typical 1940’s house and rooms. 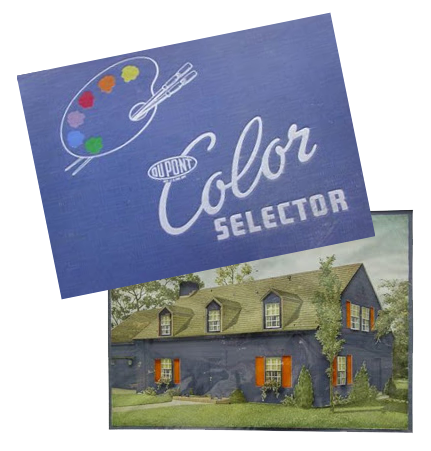 The brochure utilized DuPont’s new cellophane technology to produce overlays of what the house and rooms might look like in other DuPont paint colors. But the DuPont materials also discouraged homeowners from taking on such a task touting professional painters as the only professionals that were able to complete such an arduous task. In fact, before 1950, only one-third of Americans painted their own homes. During the 1950’s, that figure rose to 80%. But we’re getting ahead of ourselves. Photograph by Nina Leen for Life Magazine. Copyrighted. In the years leading up to the war, people with handy inclinations were hired off to work for the war effort, straining the abilities of those left at home. To alleviate this shortcoming, organizations such as the YWCA organized classes to bring basic home repair and maintenance to women. As the United States entered the war, women and men who were not able to join the service went to work in plants and factories in droves, learning hands-on skills to support the war effort. With a shortage of qualified repairmen, all families were expected to do more with less and to learn to support and repair their homes themselves. “Sabrina Ormsby Dean remembered being embarrassed as a girl by her mother who made her own window screens and installed her own plumbing. 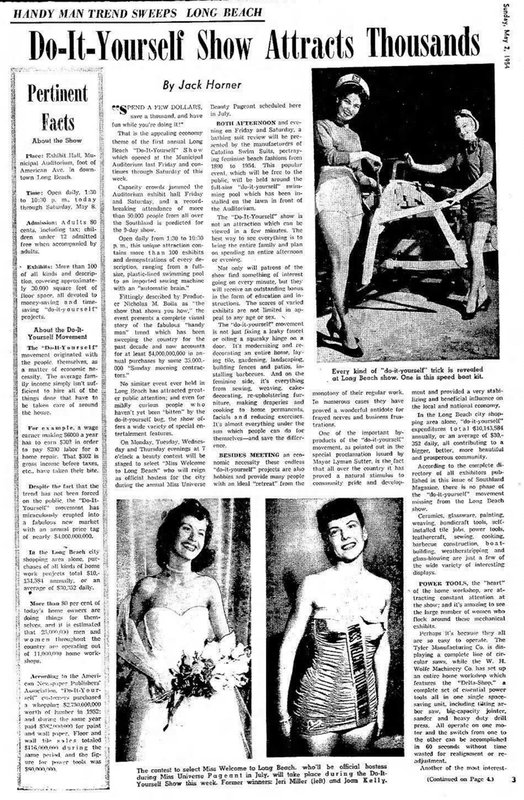 But when the war came, and women everywhere were forced to learn the skills she had grown up with, she could boast in the title of a 1943 article, ‘It Didn’t Take a War to Make a Carpenter Out of Mother’”. After the war, women returned home and began building families with their husbands. Sizes of homes had decreased yearly in the years leading up to World War II, with the average home size being two bedrooms with one bath. With the post-war baby boom, families were quickly outgrowing these homes. 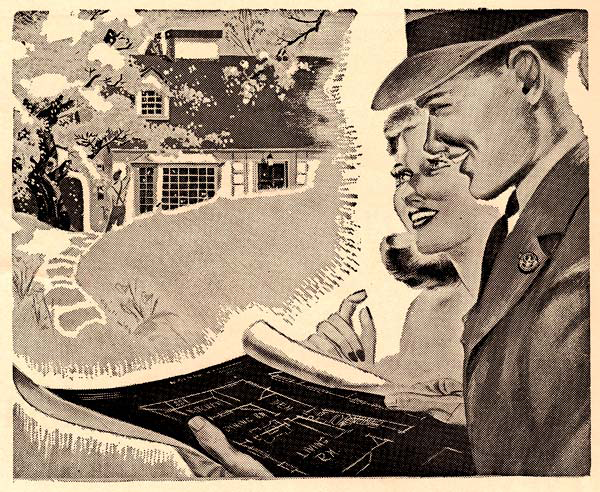 After the war came a home-building boom. Returning veterans were eligible for special financing for both education and homes through the G. I. Bill. More people than ever were becoming homeowners. By the 1960’s, dwellings occupied by owners went from 37% to 60%. Only three million families owned homes at the turn of the century while by 1960, 30 million did. In accordance, the do-it-yourself movement also boomed. From the book, The Gender and Consumer Culture Reader edited by Jennifer Scanlon. 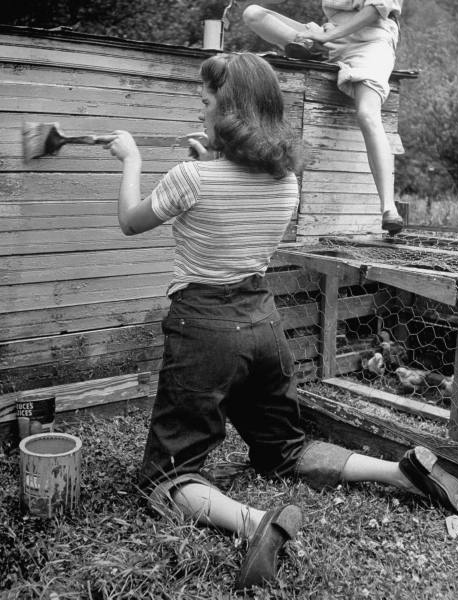 The only two past times more popular that do-it-yourself in the 1950’s were reading and watching television. Outside of home ownership, what created this boom? 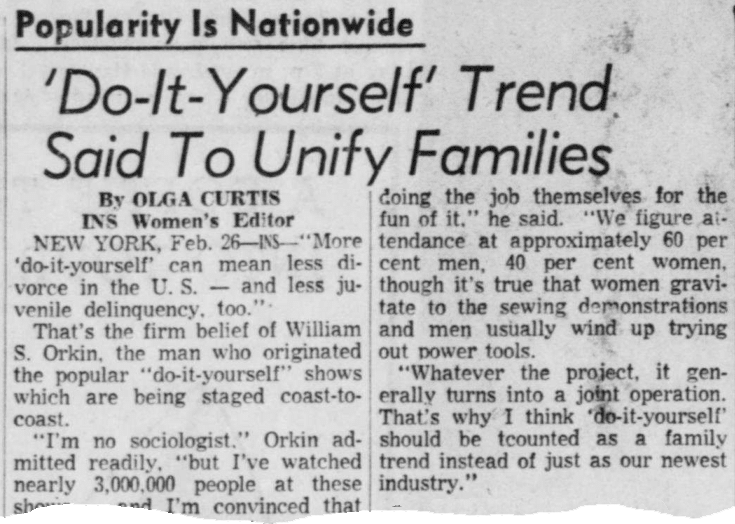 The do-it-yourself movement had many contributing factors. The prevailing thought was that the pleasure and joy that came from making something with your own hands had both psychological and therapeutic benefits. 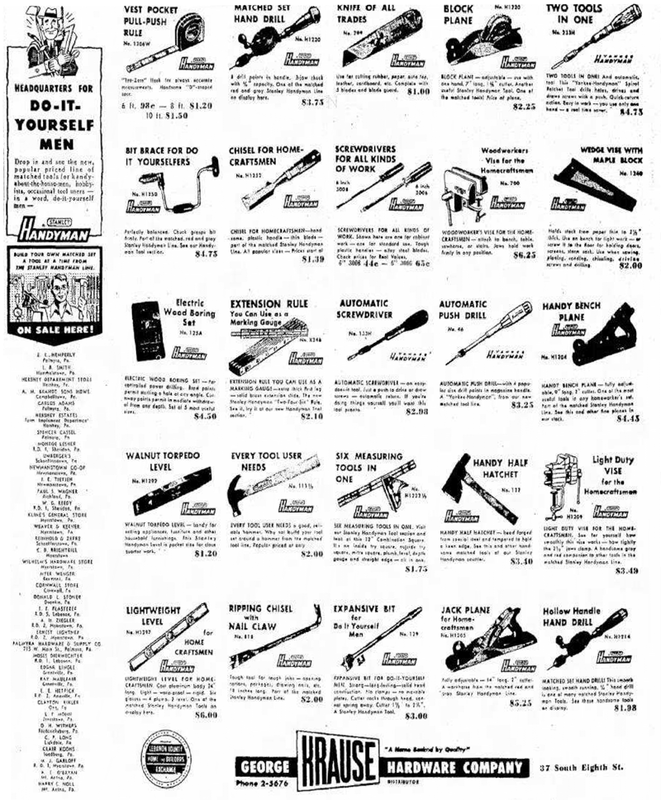 In fact, there was an increase in hardware stores offering “repair clinics.” The use of the term “clinic” speaks to the concept of home repair as medicine. “The do-it-yourself movement is not just a hobby. It is often a pleasant and meaningful contribution to family life”. Not surprisingly, the do-it-yourself movement also gave rise to the home improvement industry. 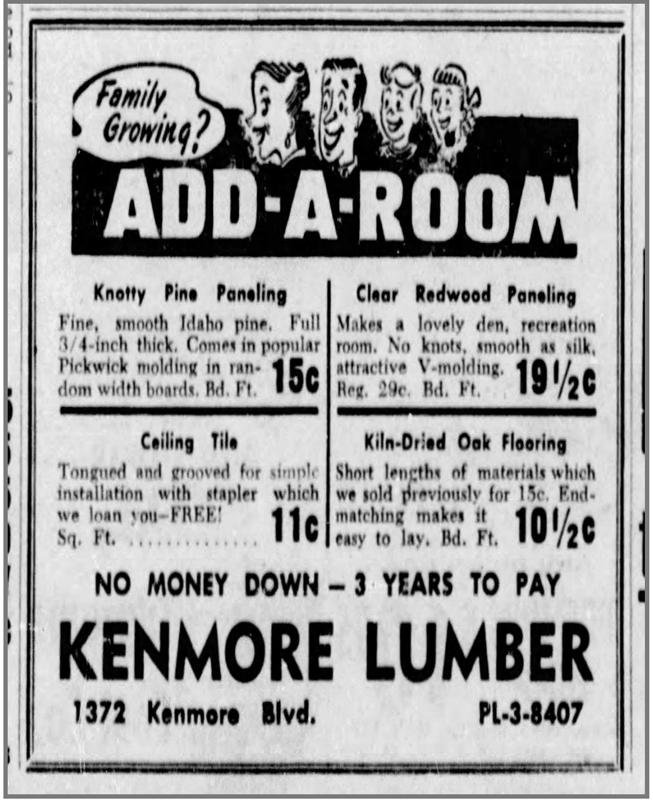 Before World War II, companies with construction products did not advertise to the do-it-yourself-er for fear of alienating their commercial clients. 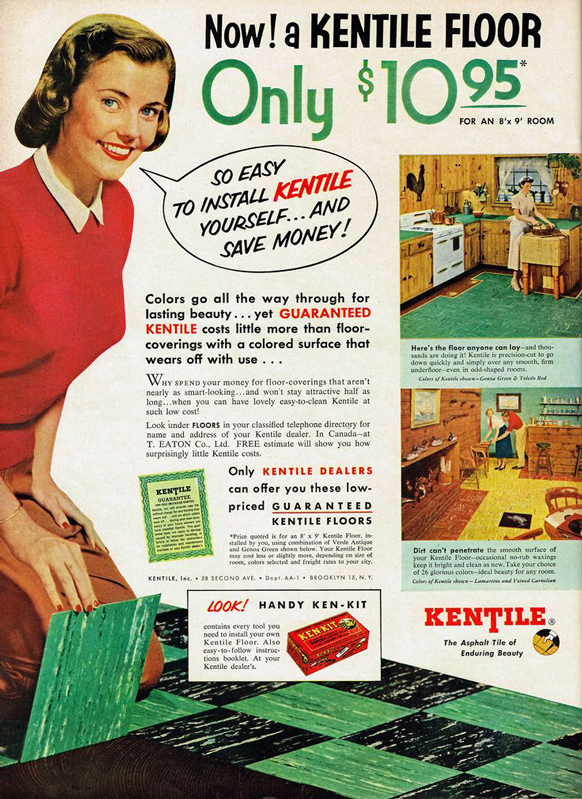 One of the first companies to advertise to DIYers was Kentile, showing homeowners how one could easily upgrade their floors over the weekend. Power tools, too, became much more affordable for the average home hobbyist. Manufacturers started to make tools out of lighter and less expensive aluminum rather than steel. Manufacturers also brought industrial designers on-board to design tools that were not only useful but attractive to look at in the home workshop. It was during this period when industrial designer Henry Dreyfuss introduced a line of power tools for DeWalt using the yellow color ubiquitous to the DeWalt company to this day. Once the floodgates were open to a new revenue stream (homeowners), the worry of alienating professional craftsmen was forgotten. 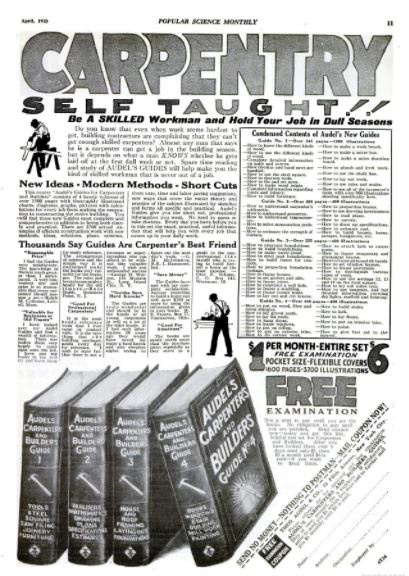 You couldn’t open a newspaper or magazine without “Do-it-Yourself!” ads and articles jumping off the page. 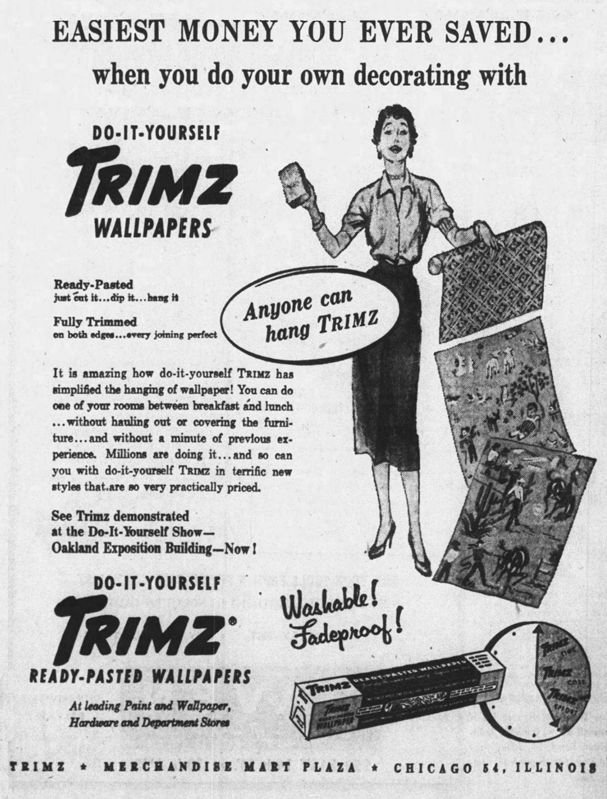 The products once marketed only to professionals now introduced easier to handle facsimile products such as latex paint (easy clean-up with water) and pre-pasted wallpaper. 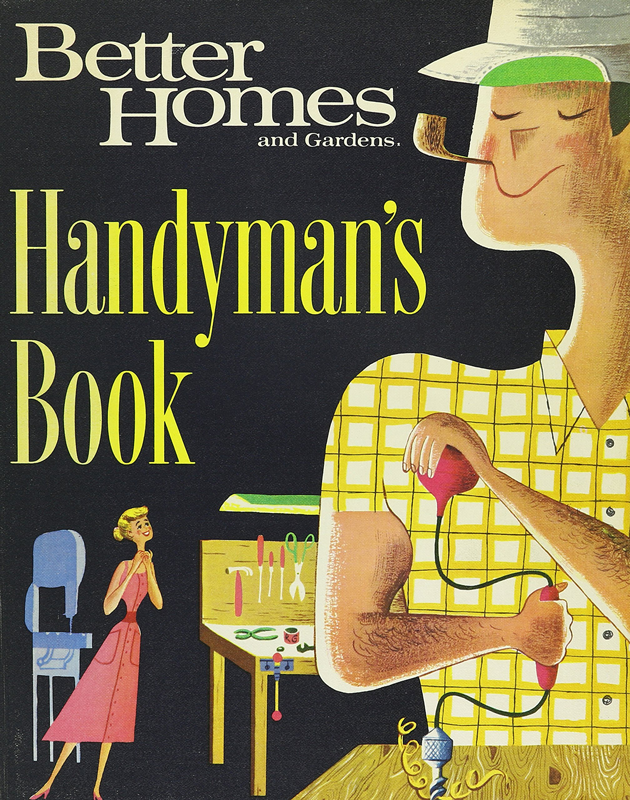 Handyman- or Do-it-Yourself-ism reached a fever-pitch in the 1950’s. The craze even went so far as to create traveling road shows, do-it-yourself conventions that would travel from town to town. Men could revel in the newest tool; meet others like themselves and swap workshop stories. Historian Steven Gelber who has written extensively on the topic called this the phenomena of “productive leisure.” Every male homeowner carved out a home workshop, in the garage, the basement, or anywhere else in the house they could find, including the kitchen. (A downside of the popular Eicher’s of California were that they had no basement and only a carport.) Albert Roland from a piece published at the time called the home workshop for men, “[A] touchstone for evaluating life around them – and their own” and “[A workshop allows men to gain] individual identity and satisfaction they don’t get from work.” Cathy D. Smith in her book, Handymen, Hippies and Healing: Social Transformation through the DIY Movement (1940’s to 1970’s) in North America went as far as calling the need for DIY as a symptom of an individual’s need for self-actualization. Heavy stuff, this home improvement movement! By 1953, 10% of the plywood manufacturer’s product was being sold directly to homeowners. Better Homes and Gardens even published plans for Sam Maloof-designed furniture that the avid do-it-yourself-er could create. But it was not just furniture that do-it-yourself handymen were tackling. Remember the lack of bedrooms in homes built before the war? Not only were existing homes small, but even new homes were built small to keep home prices down. However, these homes often came with unfinished areas that the home handyman could finish. One such home developer was William Levitt and his company Levitt & Sons whose developments sprang up in the late 1940’s to early 1950’s. Many of the homes at Levittown were only two bedroom homes with “expansion attic” spaces as a way to keep initial costs down and make a new home affordable to all. 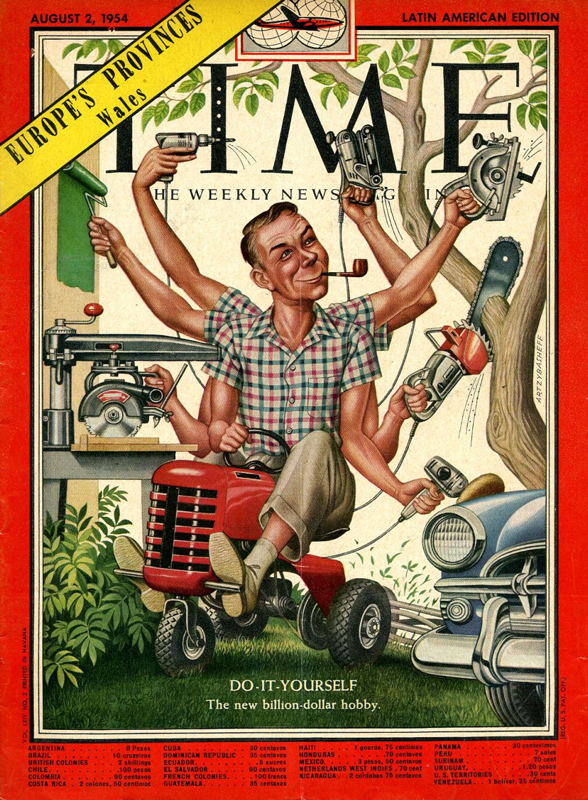 In 1954 Time magazine published it’s August 2nd issue entitled, “Do it Yourself: The New Billion Dollar Hobby.” James Gilbert in his book, Men in the Middle: Searching for Masculinity in the 1950’s, called the family handyman, “[The] frontiersman of the suburban badlands.” Estimate state that in the 1950’s over 60 million Americans were involved in handyman associated hobbies. 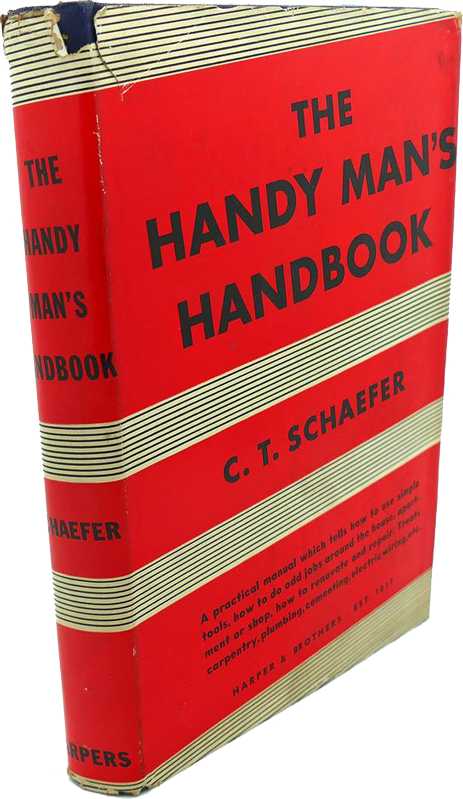 Magazines and other publications for the home handyman also arose from this era. The Family Handyman and Workbench Magazine, still published today, were both founded in the early 1950’s. There were also several “How-to” series of books on the market. Publisher’s Weekly began a series called “How-to-Do-It” books in 1950. 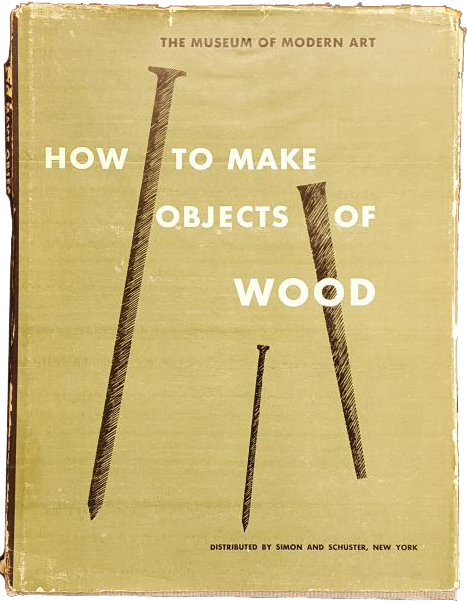 In 1951, three of the top five non-fiction bestsellers related to the do-it-yourself boom. Number five was Better Homes and Garden’s Handyman’s Book. 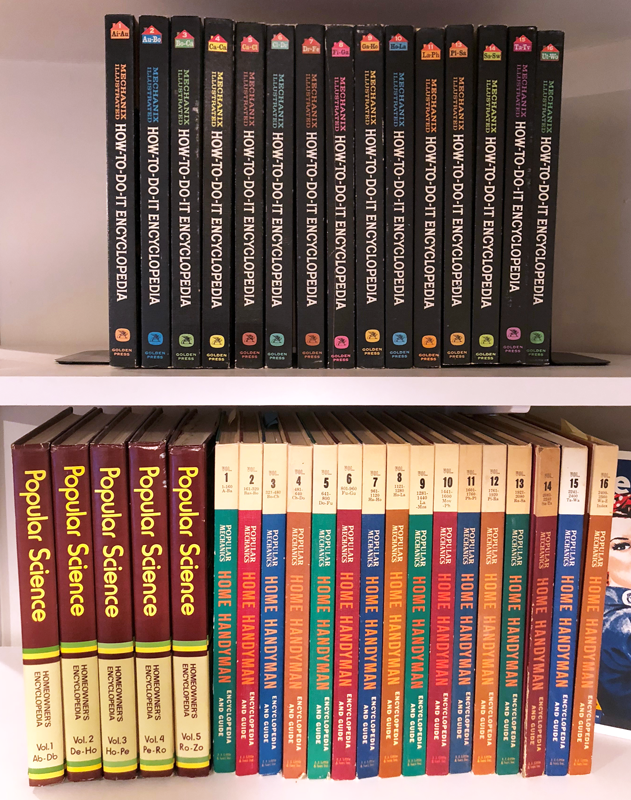 DIY Series (T-B, L-R): Mechanix Illustrated How-to-Do-It Encyclopedia (1961), Popular Science Homeowner's Encyclopedia (1974), Popular Mechanics Illustrated Home Handyman Encyclopedia and Guide (1961) from the author's personal collection. Steven M. Gelber from his book, Do-it-Yourself: Constructing, Repairing and Maintaining Domestic Masculinity. So what came of the do-it-yourself movement? Today, many men (and women) no longer have home workshops to retreat to – they have “man caves.” (As you may know first-hand, nothing helpful ever gets done in a “man cave”). 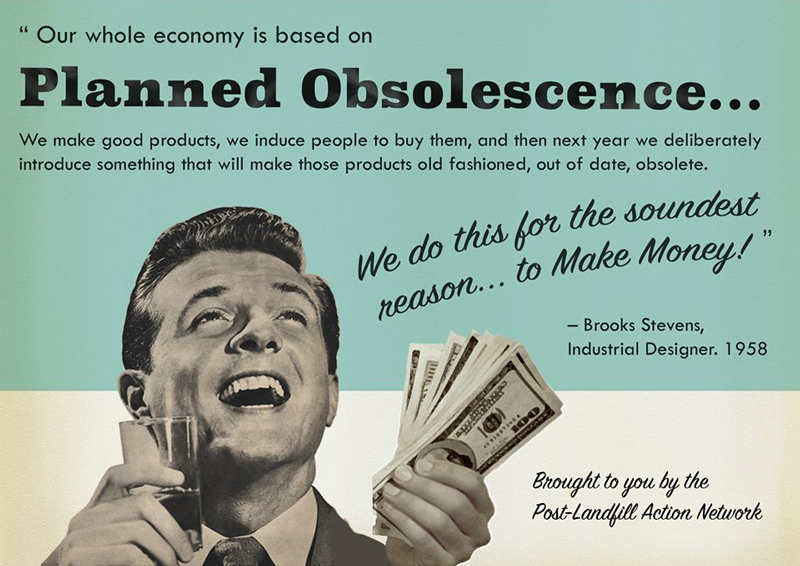 One explanation is that alongside the rise of do-it-yourself culture, the 1920s and 30s also saw the birth of planned obsolescence. 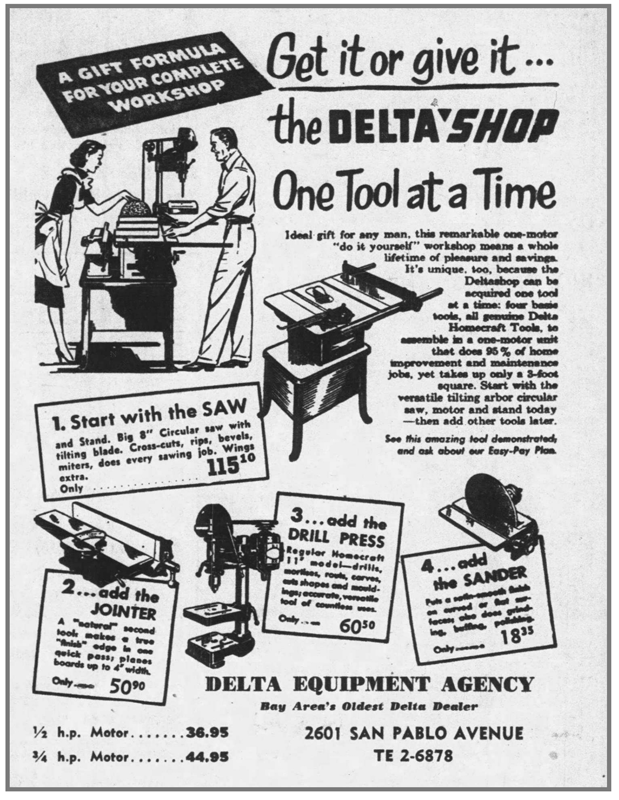 Remember those power-tools that became cheaper in the 1950’s through cheaper materials which helped support the do-it-yourself movement? Those cheaper materials meant that the tools didn’t last as long. Planned obsolescence in the do-it-yourself world has only gotten worse: now our power tools are combinations of plastic and rechargeable batteries (of which only 3.2% are recycled in the United States). Additionally, assembly methods of products became cheaper and more automated meaning sealed casings and irreparability. 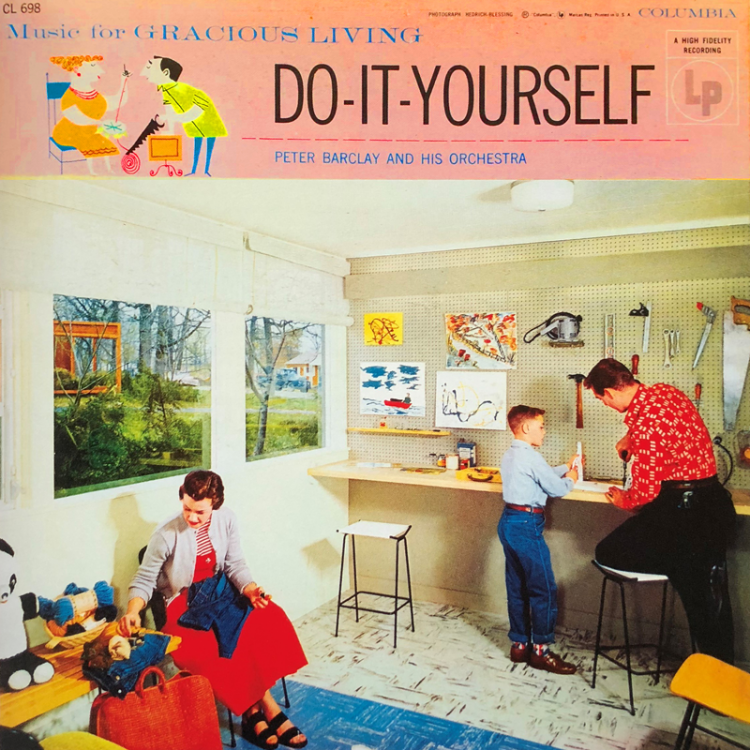 Here in the Make it Mid-Century family, we still believe in good, old-fashioned DIY. We believe in the therapeutic nature of making something with your own hands. And we believe that we all still have it in us to learn (or at least try). That’s one of the reasons behind our do-it-yourself products. Our products are made to replicate the 1950’s, not only in style but in application. So when we say, “You can do it!” we mean it. So what are you waiting for? Time to dust off the workshop (or create one) and find a project to do. Delphia, Rachel, et al. “Designing the Tools for America’s ‘Do-It-Yourself’ Movement.”Silver to Steel: the Modern Designs of Peter Muller-Munk, Carnegie Museum of Art, 2015. Read excerpts here. Purchase here. Gelber, Steven M. “Do-It-Yourself: Constructing, Repairing and Maintaining Domestic Masculinity.” American Quarterly, vol. 49, no. 1, 1997, pp. 66–112., doi:10.1353/aq.1997.0007. Read here. Gelber, Steven M. Hobbies: Leisure and the Culture of Work in America. Columbia University Press, 1999 Read excerpts here. Purchase here. Gilbert, James Burkhart. Men in the Middle: Searching for Masculinity in the 1950s. University of Chicago Press, 2005. Read excerpts here. Purchase here. Goldstein, Carolyn M. Do It Yourself: Home Improvement in 20th-Century America. Princeton Architectural Press, 1998. Read excerpts here. Purchase here. “Handymen, Hippies and Healing: Social Transformation through the DIY Movement (1940s to 1970s) in North America.” Architectural Histories, vol. 2, no. 1, 2014, p. 2., doi:10.5334/ah.bd. Read here. Harris, Richard. 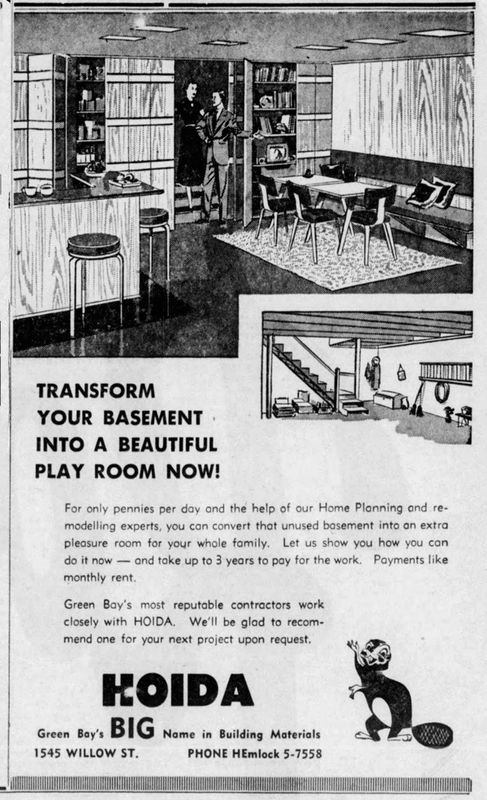 Building a Market: the Rise of the Home Improvement Industry, 1914-1960. S.n., 2012. Read excerpts here. Purchase here. Roland, Albert. “Do-It-Yourself: A Walden for the Millions?” American Quarterly, vol. 10, no. 2, 1958, p. 154., doi:10.2307/2710080. Read here. Scanlon, Jennifer. The Gender and Consumer Culture Reader. New York University Press, 2000. Read excerpts here. Purchase here.